Artist, DJ and club promoter Kohib, aka Øivind A. Sjøvoll, released his debut album Make Fire in 2010. After the release of the album, several friends from the Norwegian electronic scene asked to do their take on different tracks from the album. Some where planned as singles, some where done just for fun. And now, they are finally collected in one big EP!! Støyvind makes a snappy, poppy take on Push Me Down, while Syntax Erik (aka KYD from the house-duo Kyd & Kango) makes a more minimalistic techno approach on My Command. Kohib himself does a deep techno-dub of The Fang Song, and an old school discohouse version of Push Me Down. Boska (who recently released an EP on Mental Overdrive's Love OD label) originally made a broken beats-ish version of Push Me Down in 2010, but revisited the track in 2011, pushing it more into dubstepish territories. The space disco remix collaboration of Frisvold & Lindbæk (who released the remix-compilation Diskoism in 2010) has done a nice dubby disco take on Tales From A Nomad. Fellow Beatservice funkster Dennis Jr re-builds The Fang Song into a smooth syncopated jazzy groove, while the ambient rising star Lepetitgarcon (who released his Biosphere remixed debut EP earlier this year) has done a breathtaking and intense tripped out drone-version of Hear This. 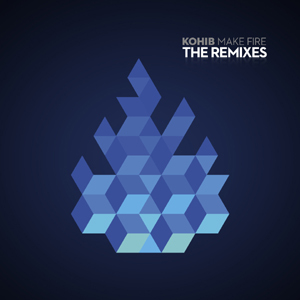 So, there it is, an album length collection of remixes, all for the price of an EP!! !